Hans Gál (1890-1986) escaped the Nazis and fled to Scotland, while Hans Krasa (1899-1944) after internment in Theresienstadt was finally barbarically murdered in Auschwiz. With her ​​carefree melodies and her dance elegance Hans Gal’s nearly half-hour neoclassical Serenade from 1932 recalls Mozart. In Gal’s Trio from the year 1971, the viola is the most important voice, around which cello and violin is ensnared: The charm of the composition is the conversation between the three instruments of Chin, Yang and Woods, and receives a stimulating and inspiring performance. The recordings are another compelling example of the campaign Kenneth Woods leads for the music of Hans Gal with as much love as for the music as expertise. 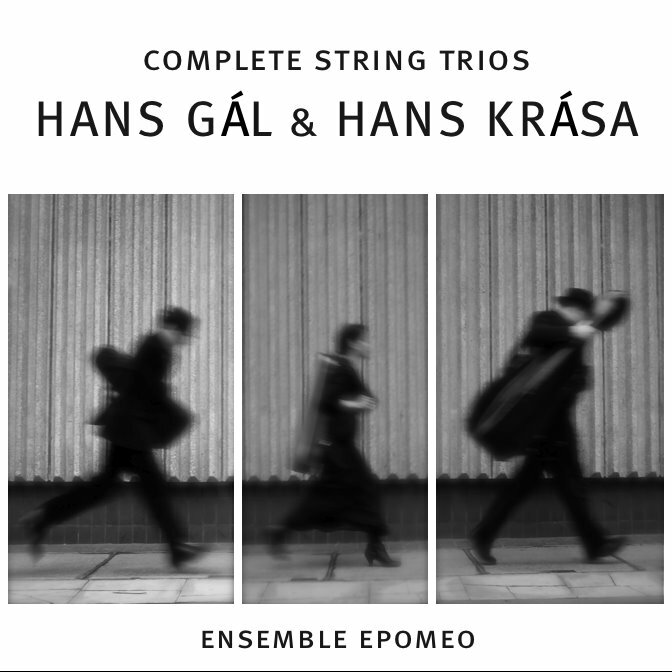 “…In yet another release from Avie, Gál’s two pieces for string trio are performed by Ensemble Epomeo, whose cellist is none other than that all-round musician, Kenneth Woods. The Serenade in D dates from 1932 and is light and droll in character without any lowering of the composer’s usual high standards of inspiration and formal mastery. A varied, protean opening Capriccioso delights in catching the unwary listener off balance with its sudden shifts of harmony, texture and dynamics. The ensuing Cantabile features a flowing and luxuriant melody introduced by violin and later assumed by the viola over richly harmonized textures. Classical grace informs the Menuetto, with a romantic trio theme unexpectedly languishing at its centre. The concluding Alla marcia matches the opening movement in devious twists and turns of melodic invention and contains at its heart a typically song-like theme which takes wing effortlessly. The other Gál piece on the disc, his Trio in F sharp minor, dates from 1971. Commissioned by the London Viola d’Amore Society, it was originally scored for violin, viola d’amore and cello, though the composer also made a version for standard string trio at the same time, and it is in this latter form that the piece appears on the Avie CD. Though it dates from the same ‘late’ period as the composer’s Triptych for orchestra and Fourth Symphony reviewed above, the Trio is made of sterner stuff. In this rigorously worked-out piece Gál seems to be consciously making connexions with the Austro-German legacy to which his carefully honed musical voice is entirely attuned. An expressive viola solo launches a deeply passionate yet at times wistfully introspective opening Tranquillo con moto. The central Presto’s pointedly rhythmic, principal idea, sempre staccato, is contrasted with a more flowing trio-like episode and is wafted away in a delightfully insouciant closing gesture. Genuine emotional depths are plumbed once again in the concluding theme and variations, each of which is distinctive, yet assumes a logical place within the movement’s cogent overarching structure. One of the most impressive and penetrating of Gál’s later works, the Trio’s craftsmanship is impeccable and, as with all worthwhile compositions, it demands and rewards repeated listening. These two contrasting Gál works for violin, viola and cello are accompanied by a pair of similarly scored pieces by the Czech composer Hans Krása (1899–1944). Both were written in 1944, whilst the composer was in the Terezin concentration camp and shortly before he was murdered at Auschwitz. Tanec (Dance) shows the quirky influence of Janáček, whilst substantial Passacaglia and Fugue, the last music Krása completed, is more profound and disquieting, at least in the Ensemble Epomeo’s performance, which, at an initially measured tempo, digs deep into this deeply moving score, ensures that each variation is effectively delineated, and brings instinctive virtuosity to the frenzied and terrifying deconstructive conclusions to both the Fugue and Passacaglia sections of the piece. Now In Stores- The Debut CD!